Aswath Damodaran holds the Kerschner Family Chair in Finance Education and is Professor of Finance at New York University Stern School of Business. Before coming to Stern, he also lectured in Finance at the University of California, Berkeley. Professor Damodaran received a B.A. in Accounting from Madras University and a M.S. in Management from the Indian Institute of Management. He earned an M.B.A. (1981) and then Ph.D. (1985), both in Finance, from the University of California, Los Angeles. His skill and enthusiasm in the classroom garnered him the Schools of Business Excellence in Teaching Award in 1988, and the Distinguished Teaching award from NYU in 1990. His student accolades are no less impressive: he has been voted "Professor of the Year" by the graduating M.B.A. class five times during his career at NYU. 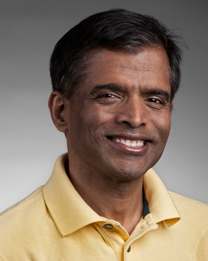 In addition to myriad publications in academic journals, Professor Damodaran is the author of several highly-regarded and widely-used academic texts on Valuation, Corporate Finance, and Investment Management. Professor Damodaran currently teaches Corporate Finance and Equity Instruments & Markets. His research interests include Information and Prices, Real Estate, and Valuation.